Two years after President Thein Sein opened the doors of his country to usher in economic and political reforms, there are fears that the country formerly known as Burma is getting quickly and dangerously off track. Once suppressed views shaped by an undercurrent of hatred have recently burst to the surface. In the spotlight, as a result, is Meikhtila, an ancient garrison town in central Myanmar. A wave of anti-Muslim violence there in late March left 43 people dead — most of them Muslims — and displaced nearly 13,000 others after their homes, businesses and even a religious school were attacked. The mobs were led by radical Buddhist monks — while the country’s usually trigger-happy security forces did nothing to stop the carnage spread over three days. Such an explosion of “Buddhist” rage was not the first in the country enjoying the new taste of freedom. Last year saw another group of Muslims, the Rohingya minority, being targeted by ethnic Arakan/Rakhine Buddhists in Western Burma. Two orgies of violence, in June and October, killed over 200 people and left some 140,000 homeless. Most of the victims were the stateless Rohingyas, whose once official identity Burma’s successive military regimes since 1962 have refused to recognize, with tacit support from the society at large. Arakan Buddhist monks were implicated in this wave of hatred, too, including efforts to even deny humanitarian assistance to the victims in makeshift shelters. 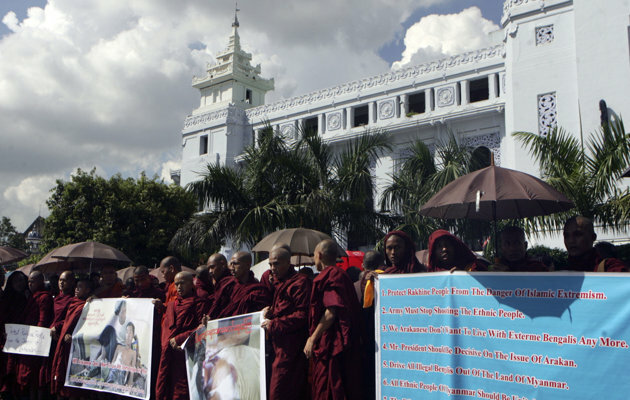 This fault line has forced the country of nearly 60 million people — of which an estimated five percent are Muslims — to face a barrage of criticism about the nature of its local version of Theravada Buddhism, followed by the majority. This chorus includes outspoken Burmese critics living in exile and even respected international Buddhist organizations known for being champions of peace and moderation, such as the International Network of Engaged Buddhists (INEB), and other spiritual leaders including His Holiness the Dalai Lama and Archbishop Emeritus Desmond Tutu. Ajarn Sulak Sivaraksa — a highly respected Thai Buddhist philosopher, public intellectual and one of the founding fathers of INEB. Maung Zarni — an outspoken Burmese critic, blogger and visiting fellow in the Civil Society and Human Security Unity, the London School of Economics. A speaker from inside Myanmar, whose identity will be revealed on the night of the panel. Veronica Pedrosa — independent journalist working for Al Jazeera English, who will moderate the panel.